Life was hard on the early Keweenaw copper mining frontier. While most of the early miners were single men there were those who brought their families with them to this new land. 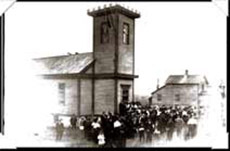 When the Central Mine opened in 1855 the company used a building at the neighboring Northwestern mine as a school for Central children. By 1861 the school was serving 79 children, almost double the number it served in 1859. The school grew as the mine grew and now was busting at the seams with 226 students in 1870. The original school house near the Northwestern property was now supplemented by the use of two basement classrooms in the Methodist Church. In 1877 there were 288 students trying to fit into the old school house. The school had earlier begun to use the Methodist Church basement for classrooms and now even that was full of students. The Central Mining Company decided to build a new school to house the ever increasing school population. They selected a site on the bluff overlooking the town with a commanding view of the valley and town below. 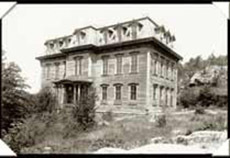 It is said that the school was placed on the bluff so that the noise of the children at school would not bother the night shift miners who were asleep in the homes below during the day. (However, as an interesting side note, the school was placed rather closely to the mines dynamite storage building that was also on top of the ridge.) The three story school building had four rooms each on the lower two floors and an auditorium on the third floor. It cost the company $7, 500 to build the school which was designed to hold 350 students. It opened to a population of 305 students in 1878. In 1879 it served 352 students, just above the capacity for the building; however the average daily attendance for 1879 was reported as 221 per day so it is doubtful that all 352 ever showed up on the same day. The Central school served as a center for the community. The annual Methodist Church concert was held in the auditorium on the third floor. In his book about Central Alfred Nicholls notes that the stage had a table-canvas drop curtain, a half dozen oil lamps as foot lights, and a hand bell to announce the rising of the curtain. Seating was a series of benches with two aisles between them. While the floor of the auditorium was level, each bench from the first to the last row rose a little in height until it was almost necessary to use a footstool to sit on the benches in the last rows. Plays, vocal concerts, and the Central Cornet Brass Band all performed in the auditorium. As the copper began to run out the mine began to lay off miners. The school population began to drop as men left to seek work at other mines and the school served 245 students in 1881 and was down to 201 by 1888. By 1895 enrollment was down to 82, the same general level as 1861-62. By 1901 the State of Michigan noted that the mine “has been closed a number of years”. The once magnificent school building had closed. School enrollment was now down to 13 pupils and classes were now being held in the Temperance Lodge Building. The school that once employed 5 teachers now employed one. In a few more years those students remaining at Central transferred their work to the neighboring school at Eagle Harbor. The magnificent school building was razed and much of its wood left Central to become part of other buildings in the Keweenaw.